With Blur (headliner), Jacob’s mouse, Beatnik Filmstars, Big Geraniums en Auratone. After America we did a couple of festivals in Europe. These were in Amsterdam and Mons (Belgium). 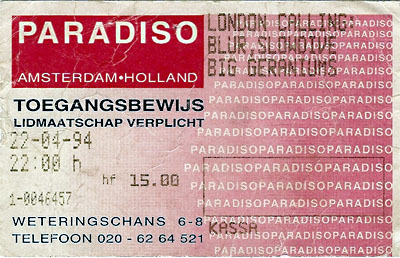 These were both indoors, and Blur were the main band. We were out for around five days. Both gigs were pretty mental (...) Blurs [sic] set took an interesting turn when Damon did his usual ‘climbing up the pa stack’, and fell off, only to bring the speakers with him and consequently breaking one of the security guards [sic] foot! He was briefly hospitalized too! Silly behaviour! Said guard came back to the show after he’d been bandaged up and peace was made (eventually), so it wasn’t all bad. Amsterdam was predictably good fun, spent a day off there enjoying coffe [sic] shops…….